Owensboro, Kent. 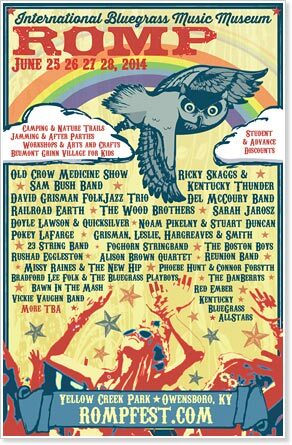 — Old Crow Medicine Show, Ricky Skaggs, Sam Bush, David Grisman, Railroad Earth, Del McCoury, Doyle Lawson, Sarah Jarosz, and The Wood Brothers are among the dozens of talented acts set to perform at Owensboro's ROMP Festival, June 25-28. ROMP Festival is a four-day music and camping festival hosted at both the museum, in downtown Owensboro, and at Yellow Creek Park, a gorgeous 150-acre facility that is a perfect setting for a music festival. ROMP features traditional and legendary bluegrass artists alongside old time and progressive bluegrass musicians who expand the boundaries to the far-flung roots and branches of bluegrass. Entering its 11th year, ROMP is the main fundraising event for the International Bluegrass Music Museum. Thousands of people from around the world will gather for this unique, award-winning festival which includes music performances by 29 bands, organized kids� activities including a water spray park and playground, healthy food concessions, original arts and crafts, artist workshops, a film festival, new exhibits, and the infamous after parties. The International Bluegrass Music Museum, located in the RiverPark Center in Owensboro, is the world�s only facility dedicated to the history and preservation of the international history of bluegrass music. Museum admission is free to festivalgoers. A free shuttle service takes campers and other ROMP attendees from Yellow Creek Park to the museum and back from 10:00 a.m. to 5:00 p.m. during the festival. There will be live performances, original films, and new exhibits at the museum taking place during the daytime hours. The following is the schedule for artist workshops during ROMP. Workshops are free of charge with paid entry to the festival, and are open to any attendee wishing to participate.